He was just doing funny ‘stuff’ with his hands. Most puzzlingly, the structure of his hand and body movements didn’t seem to change no matter what the speaker was saying. 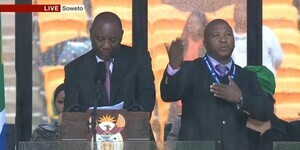 And, in one of the most bizarre Deaf stories of recent years, it appears that there really was something wrong – because the interpreter was a fake. Which meant that on a day when the world saluted a man who fought oppression, a guy stood on stage and effectively oppressed another minority – Deaf people, by making a mockery of our language. Posted in Misc and tagged sign language at 9:58 pm on December 10, 2013 by Broadsheet.